Over his 10-plus years in the big leagues, Melky Cabrera has stepped up to the plate more than 5,000 times. He’s faced Roy Halladay and Felix Hernandez, Clayton Kershaw and David Price — the best pitchers of his generation, throwing all kinds of blazing fastballs and vicious off-speed stuff. On June 8 against the Astros, he faced something none of those aces had ever thrown. In the fourth inning, a 1-2 pitch came in thigh-high, only to drop down to his toes. It started at the outside corner and ended a foot off the plate. It looked like a sinker crossed with a screwball, sprinkled with the kind of black magic you’d only encounter in a nightmare. That evil pitch lit up the radar gun at 94 mph, a shocking reading for an offering with that much violent movement. The baseball Internet quickly lost its mind, wondering what the heck the pitch could’ve possibly been. Soon enough, Astros rookie Lance McCullers Jr. took to Twitter to give us an answer: It was his new changeup. He’s also got a screaming fastball that can touch the high 90s, and a deadly and versatile curveball he can manipulate in countless ways. In fact, if you ask Astros brass, prospect hounds, or McCullers himself about his changeup, they’ll all say the same thing: It’s the worst of the trio. 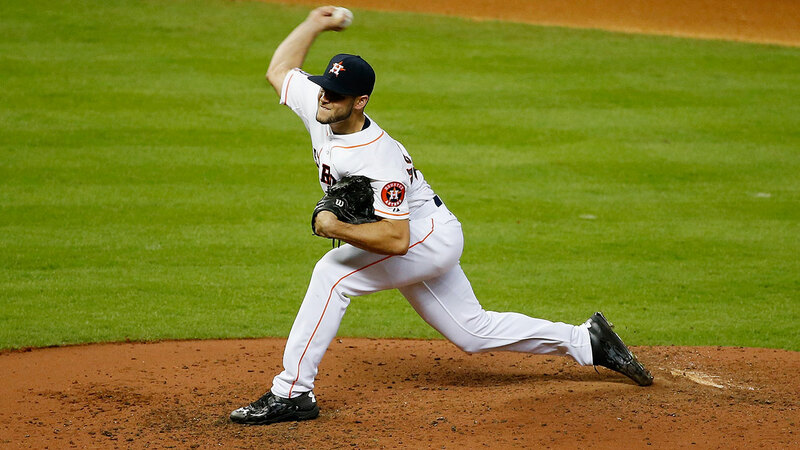 If McCullers keeps up his current pace, it won’t be long before he’s a great starter. Through the first six starts of his major league career, he’s punched out 40 batters, allowing just 22 hits and flashing a 2.00 ERA in 36 innings. He has allowed more than two runs just once in those six starts, and he has only allowed one homer, which came in the at-bat right before he took down Cabrera. However, unlike Carlos Correa and other members of the never-ending conveyor belt of top-shelf talent that is Houston’s farm system, McCullers wasn’t quite a blue-chip prospect coming into the season. He failed to make any major top-100 lists after cracking a couple in 2014, but had the experts known what the power changeup would become, they surely would’ve paid closer attention. Then again, being slightly undervalued is what brought McCullers to Houston in the first place. 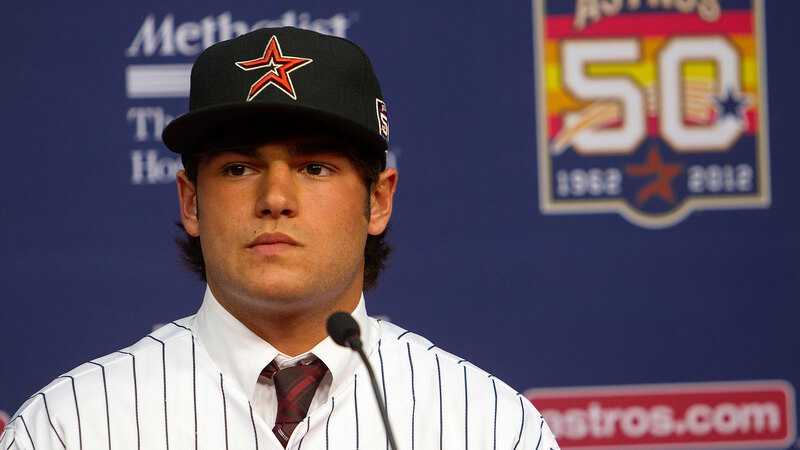 As a teenager, McCullers made the Team USA 18-and-under squad as a high school underclassman. By his 16th birthday, he was rocking a 97 mph fastball. He also threw a devastating breaking ball — held with a spike-curve grip — that could be made to look like a slower curve or harder slurve, spinning off in a wide variety of velocities and directions that confused the hell out of hitters. As if all of that weren’t enough, he was the son of a big leaguer (scouts love that) who got high marks for makeup and competitiveness (ditto) and received excellent grades in school (three for three). Then why’d he fall to no. 41? The first strike against him: He was a right-handed high school pitcher, which, according to Elias and most other scouts, is the riskiest demographic in the draft because of injuries and the difficulty of projecting pitching so far down the road. The second strike: McCullers isn’t very tall — he’s listed at 6-foot-2 but closer to 6-foot-and-a-half-inch — and we still live in a baseball world that regards tinier star righties like Pedro Martinez, Tim Lincecum, and Roy Oswalt as the exception that proves the height-above-all rule. Third strike: He’d committed to the University of Florida and was set to become a Gator if he didn’t get the bonus money he wanted. So with every team that passed on him, the feedback loop started to spin faster: McCullers’s price tag didn’t change, but the slot number for each pick dropped as you moved through the first round, meaning the amount a team would have to overpay grew with every player that came off the board. But once McCullers hit no. 41, the Astros, with the extra cash saved from the Correa pick, were ready to pounce. Since then, McCullers’s travels have been much less of a waiting game. After a 26-inning stint in the Gulf Coast and Appalachian leagues in the second half of the 2012 season, he advanced to the Midwest League in 2013. As a 19-year-old, he fanned 117 batters in 104.2 innings and ceded just three homers. Plowing through high school and low-A, though, doesn’t require the same skill set as a place in a major league starting rotation. McCullers realized he needed to diversify beyond his 97 mph heater and spike-curve in order to speed his pace to the big leagues, and to thrive once he arrived. Spending 2014 at high-A Lancaster, an extreme hitters’ park in an extreme hitters’ league, figured to hurt his numbers already; committing to his new power changeup even as walks and homers piled up would make things worse. But if you looked past the 5.47 ERA and 18 homers allowed in 97 innings, you could see 115 strikeouts and a pitcher on the verge of unlocking his massive potential with a growing ability to rely on three different pitches in any situation. With a full arsenal of pitches, McCullers spent the past offseason working to gain the kind of endurance he would need to jump from his light Class A workload to the 200-plus innings he might have to throw once he made it to The Show. When he whiffed 43 batters over 29 innings at Double-A Corpus Christi, the Astros promoted him to Triple-A Fresno in mid-May — only to call him to the bigs just one day later. So far, Houston’s gotten more than it could have possibly hoped. McCullers is missing bats at a prolific clip, with a 28.4 percent strikeout rate that’s fourth-best among AL starters with at least 30 innings pitched. He’s also dominating with his secondary pitches, allowing a paltry .132 batting average against his wicked curve, and not a single hit against that freak-show changeup. Maybe the most promising sign of growth is how stingy he’s been with his walks: just 2.5 free passes per nine innings in the bigs, after a scary 4.5 BB/9 IP rate in the minors. McCullers, who wore Batman cleats in his first major league start, also seems destined to become a fan favorite in Houston. When floods recently walloped the area, McCullers reached out to Astros staffers and asked how he could help, then jumped in to provide food and supplies to displaced families. The Astros plan to be judicious with McCullers’s workload, letting him go deep into games at times (during a complete-game win against Baltimore on June 3) and taking him out early at others (after five hitless innings on June 14 in a blowout against Seattle). That’s just the kind of treatment you’d expect for a pitcher who’s this good this young. Of course, plenty of risk remains. Matt Harvey and Jose Fernandez looked invincible when they first cracked the majors, before ultimately succumbing to the Tommy John scourge. Plenty of other talented pitchers have suffered different types of injuries, lost velocity or command, or simply failed to meet expectations because pitching can be impossibly hard, and pitchers this young can be especially fragile and volatile. Still, the Astros remain bullish. McCullers just might be good enough to be one of those gifted young hurlers who bucks the odds and thrives. That’s bad news for American League hitters, and fodder for plenty more bad dreams. Drafting Correa also secured a player who, after being called up a few weeks ago, looks like he has a real chance to become a star.